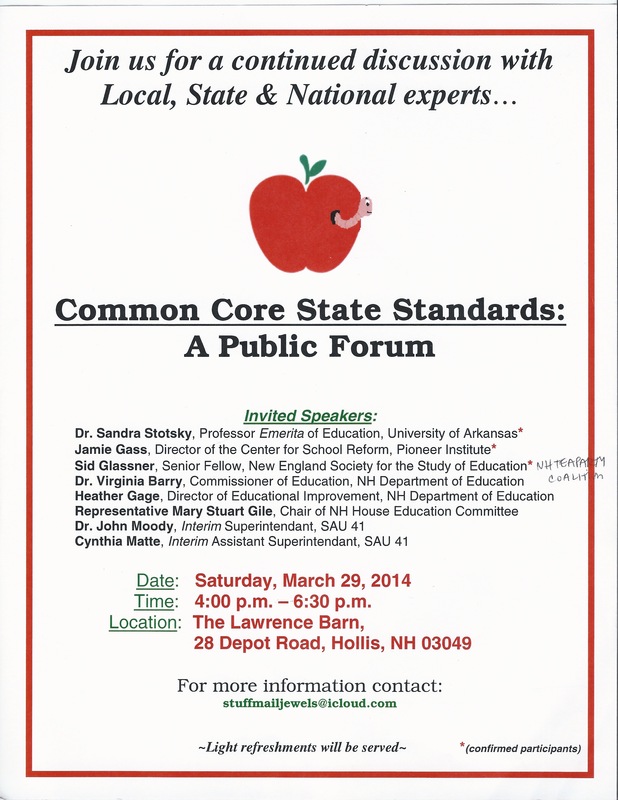 Common Core opponents held another of their forums yesterday, this one in Hollis. It was a variation on the established theme in that hosts, selectboard chair Mark Le Doux and his wife Julie, invited every senior education official in New Hampshire and listed most of them on on their flyer to highlight the inevitable reality that they would not be there. One person did come to defend the new standards, the wonderful 7 term member of the House, Rep. Carolyn Gargaz (R-Hollis). Rep. Gargaz does have concerns about the new standards, particularly about the testing, but she was one of the 17 Republican who voted to kill HB 1508, the one sentence bill that would have mandated the end the Common Core in New Hampshire. She seemed to be one of those folks from an earlier generation who went to Concord to help solve problems and that’s how she continues to think about her work there. You could hear how far outside any ideological debate she is, just thinking through the issues and casting her votes. I chose not to speak mainly because I was pleasantly surprised by both the relatively weak presentations and by the lightweight intellectual underpinnings of their arguments. The usual criticisms of process; the usual paranoia of federal power; and the references to the 1787 constitutional convention, were comical and pathetic to my mind. The panel is full of rage against the federal government and the state of Massachusetts. This has no bearing on the 3 school districts of SAU41. None of their academic concerns apply to Hollis & Brookline schools. My daughter, class of 2011, and son, class of 2014, had 8th grade algebra and AP calculus in 12th grade. They and their peers are ready for STEM majors and careers. My daughter, pre-med & Neuroscience major, Dartmouth ’15, found her Dartmouth pre-med Physics class to be easier than her Junior year HBHS physics course. My kids have read quality literature at HBHS. My kids have seen zero of the alleged teacher brainwashing voiced by the one student who spoke. There are legitimate concerns about CCSS standards, implementation, testing, funding, and teacher evaluations. We in Hollis-Brookline will be fine. We are not the problem schools/students in need of much help. Our task is to roll with the CCSS punches and not let it interfere with our program. Some portions of CCSS may well strengthen our program. Our task instead is to deflect, calmly and persistently, the ideological agenda of the anti-CCSS folks. We know who they are, what they favor, what they oppose. CCSS is the current cudgel for them. We at the Coop school board get this all the time. Perhaps new for some of you. Old hat for your coop school board. The sky is not falling. We do not have much here to fear. Please don’t feel overwhelmed. Hollis school board member, newly elected March 2014. By ANHPE in Common Core on March 30, 2014 . Bill, Speaking for myself and I think many teachers in my district. I think the school board member’s response (Hollis-Brookline) is exactly how many of us in education are feeling regarding CCSS. We’re “rolling with the punches.” We have our concerns but feel a change in current standards are necessary. Thanks for sharing her response. Everyone you don’t like is labeled as members of the NH Tea Party Coalition even if they don’t live in New Hampshire. It’s really quite juvenile to call people names in such a manner. Tea partiers can’t have it both ways, Doris. Is the tea party real or not? Let’s see…I’m not a “member,” because there are no members, I guess, but I always vote with the folks, some of whom identify that way…It’s very confusing to us outsiders. But I’ll tell you this. If there’s such a thing as the tea party, this nebulous non-group is, in New Hampshire, the primary source of political opposition to the Common Core standards. And is it a tea party impersonator sending these emails about punishing Republicans who support the Common Core? The nearly 1000 voters at the annual Hollis Brookline Coop School District voted 3 to 1 to reject Common Core and create their own higher standards. Really? Can you link us to that vote? I feel sure it would not have been an informed, fully noticed vote. And, clearly, the elected school board, who is informed, does not agree.